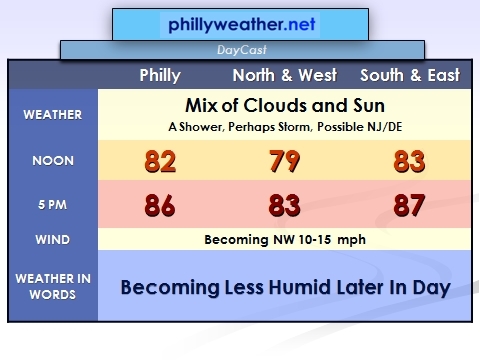 Less humid air is on the way to the Delaware Valley for a couple of days as the disturbance responsible for yesterday's scattered soakings of showers has pushed through the region. The front associated with the disturbance will begin to pull in lower humidity levels through the course of the day, with skies generally varying between mostly sunny and mostly cloudy -- we'll call it a mix of clouds and sunshine for today. A few showers can't be ruled out -- chances of those are highest (although not that high) in Jersey and Delaware over the course of the day. A rumble of thunder can't be ruled out either. Dew points could be in the 50's by the end of the afternoon across a large chunk of the region -- yes, relief is on the way! That lowering of dew points will result in an almost cool night in the Delaware Valley on Wednesday night and Thursday night as low temperatures drop into the 60's in the city, 50's outside of it. However, we will have a seasonably warm day ahead as high temperatures will be in the middle 80's for many of us.